Horizontal form fill and seal process. Vertical form fill and seal process. What are the advantages of horizontal and vertical form filling and sealing? Because the machinery for form fill and seal incorporates all stages of production automatically, the process is quick. Can seal product without heavy or expensive packaging material. 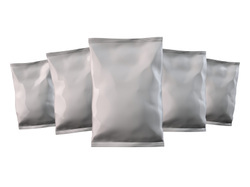 Solids, dry or liquids can be packaged using vertical form fill and seal (VFFS). We can do vertical form fill and seal. We can do horizontal form fill and seal. We can create a custom design package. We can use special die-cut shapes and/or hangholes. We can lot code, create easy-tear, a 3 or 4 side seal, etc. We can design and size packages based on its contents (the ideal model). We can use several types of materials, like special barrier films that retain moisture. We have the capacity to package 30,000 pieces per day. We can immediately accommodate sizes up to 4x7 inches (HFFS only).